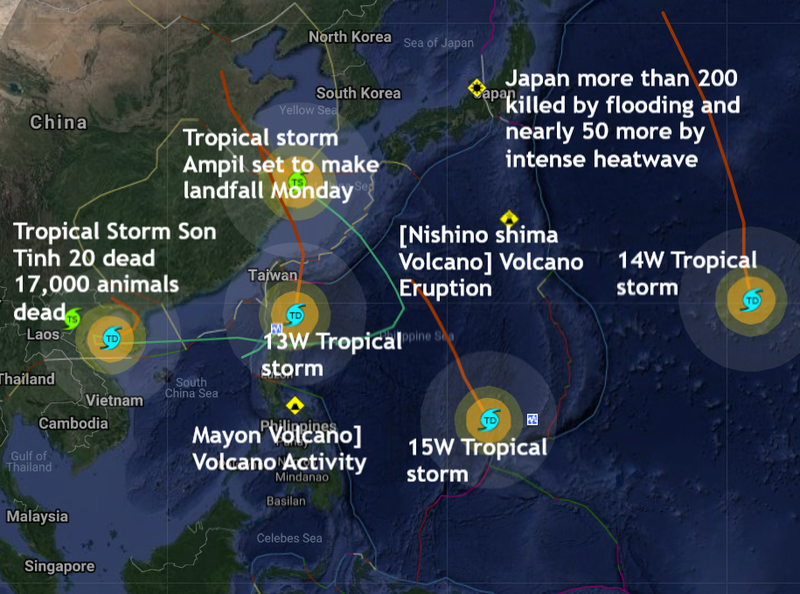 Six tropical storms two of them deadly aiming for East-Asian coastline...RSOEAlertmap. and tomorrow tropical Storm Ampil will unleash gusty winds and heavy rainfall across eastern China. Ampil, currently a severe tropical storm, tracked over Japan's Ryukyu Islands on Saturday. According to AccuWeather.com, Rainfall amounts of 100-200 mm (4-8 inches) are expected with local amounts up to 300 mm (12 inches). Several hours with wind gusts of 80-100 km/h (50-62 mph) are expected near and just north of Ampil's track. This includes the Shanghai area. Coastal locations near and north of the landfall point will also be at risk for dangerous storm-surge flooding.